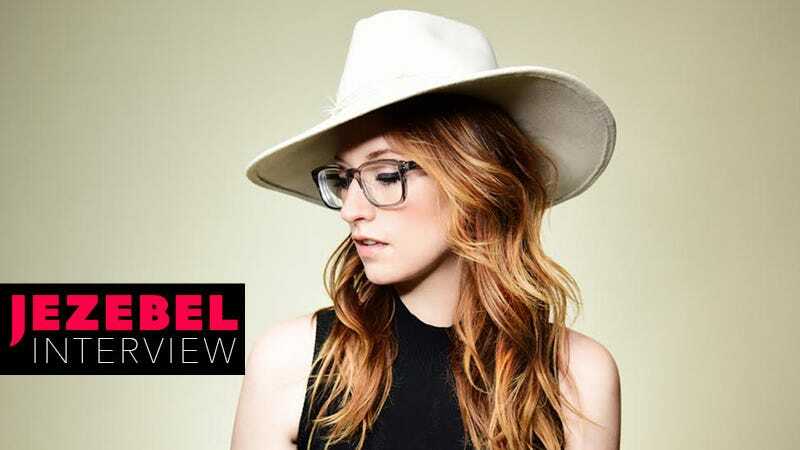 As a longtime fan of Ingrid Michaelson, the singer/songwriter responsible for romcom-friendly hits like “Be OK” and “Girls Chase Boys,” my excitement for her seventh album It Doesn’t Have to Make Sense (out today) was twofold. In addition to a fundamental desire for more of her music, I had a sort of voyeuristic anticipation of hearing the story of her recent divorce (I pay attention to these things) from a different perspective. Her ex-husband, fellow musician and sometimes-collaborator Greg Laswell, released his seventh album earlier this year. Called “Everyone Thinks I Dodged a Bullet,” it’s very much a break-up album, and its 10 tracks are alternately angry and apologetic, contemplative and enraged. So when IDHTMS was announced, I was expecting a similar album from Michaelson’s perspective—one that was about not just heartbreak in a general sense, but about her and Greg, specifically. But this album isn’t part two of Laswell’s story, and it was unfair of the most gossip-loving parts of me to expect that it would be. IDHTMS is about heartbreak, yes, but not specifically the romantic kind. This is about the death of her mother and the end of a marriage. It’s about regret and remembering, and how you can suddenly transition from unprecedented anger to being overcome by joy. None of this is new ground for Michaelson, or anyone for that matter (what would music be without heartbreak? ), but it still makes for a rewarding, occasionally stunning (see “Old Days” and “I Remember Her”), collection of songs that—while tonally all over the place—tell a story about her life that I see myself returning to for some time. I spoke with Michaelson over the phone last week. An edited version of our conversation is below. JEZEBEL: I was listening to an interview in which you were discussing how this album title sort of came to be, and how it was a collection of songs you didn’t think quite went together, but I was wondering how it began. Which tracks did you write first? INGRID MICHAELSON: The very first song written for the album was the first song on the album, called “Light Me Up.” It seemed appropriate to have that be the first song because it was the first song I wrote. It just felt right. I actually wrote that about nine days after my mom died, and those vocals are the actual vocals that we laid down that day—the day we wrote it. A lot of times you’ll lay down scratch vocals, but there was something about that take that I felt was such a timestamp of this nightmare that I was in. I wrote that in Nashville with two writers Katie Herzig and Cason Cooley who produced the track. I had a show in Nashville the day before and I was obviously trying to figure out if I should cancel it or if it was something that I should do and ultimately I did it because I thought it was something that my mother would want me to do. She was a very perseverant and strong person, and loved my music and loved that I was an artist and she was an artist. So, it’s this song about a very sad moment but also about still choosing the light over the darkness. And I think that’s a lot of what this record has. It’s got a lot of sad moments, but throughout all of it there’s definitely joyful moments and songs. I think I reference her literally, by saying mom or mama or mother in three different songs, but she’s really all over it. The title also came from when you’re going through a huge personal tragedy, if you’re not fairly religious—I don’t subscribe to any religion—and even if you are religious, it’s very difficult to understand why you lose somebody. And I remember trying to figure it out. Trying to figure out why this is happening and make sense of this. And it wasn’t until I realized that I can’t make sense of it that I was able to breathe a little more. And that’s another reason why I named the album that. Physically there are a lot of different songs that don’t make sense songs back to back, but also it doesn’t have to make sense. (laughs) It named itself, really. And it wasn’t until I realized that I can’t make sense of it that I was able to breathe a little more. So you do that several times throughout the album, and then at the end you’re finally... OK.
(Laughs) Exactly. Do you think that’s a fair description? I think it’s OK to celebrate the moments where you really feel great and to be in those moments where you really feel great, and it’s OK to—this is an odd way to say it—but it’s OK to celebrate the bad moments and the dark moments and to know that life is always going to be a balance of both of those things. That’s what I think I unknowingly sort of put together. The songs are, like you said, all over the place. But, and I keep saying this, but it makes sense to say that doesn’t have to make sense! Ultimately I think I’m a fairly positive person. I try to put hope into some of the sadder songs. The song called “I Remember Her,” that’s just... very sad. It’s also a snapchat, oh god, snapshot of my life—literally of my life, of the house I grew up in, the nighttime rituals, my mother falling asleep with me. It’s a little bit of an up and down record, especially if you listen to it in the order that I put it in. I don’t know if anybody listens to records in order anymore. That’s just how life goes, and that’s just how life always goes. Until you die! “Old Days” is probably my favorite song on the album, probably for the exact reasons you said. It’s knowing in a sense that it’s sad, but not bleak. There’s a category of music that I personally like. I don’t know how else to describe it, but it’s something I’ve noticed that you do particularly well. It’s music that makes you wistful and longing for things you haven’t experienced? Yeah! Yes. I know what you’re talking about and I feel that way with certain songs. It’s this melancholy recognition. Even if you can’t quite put your finger on it. That’s what I like about the phrase “Old Days,” because it conjures up such happy feelings. You know, even in a dark moment you can always go back to the old days and I thought that was a nice way to end it. It’s not ending on an up up up song, but it’s not ending on a down down down song. It’s ending on a song that teeters between both. There’s a line on “Miss America” where you say, “Just like my mama told me,” and I’m not sure if I missed it or what, but what were the things your mama told you? The line is “there’s so many ways to be beautiful.” My mom never pierced her ears or dyed her hair or had her nails painted. She barely ever wore dresses or skirts. She wasn’t, you know, your typical quote unquote “feminine female.” That being said, I think she was really beautiful and strong and powerful. She was never like, “Ew, I’ll never do that, I’ll never dye my hair.” It was just a choice she made. She was who she was. And as a young girl, you emulate your mother naturally. It Doesn’t Have to Make Sense is available today.